Tanning salons should be welcoming, pleasant environments where guests feel relaxed as they treat themselves to a pleasant and indulgent experience. From the reception area through the halls and into individual rooms, the environment and décor should create an uplifting feel. Decorate with a theme you carry throughout your entire space. Since a tanning salon gives customers a sun-kissed glow, consider beach, lagoon, cabana or tropical décor options. Use silk palm trees strung with party lights, sunrise or sunset color palates for walls or watercolors in shades of blue and green. Full-wall murals of waterfalls, white sand beaches and tanned bodies on deck chairs can also be inspiring, as can straw mat rugs, faux tiki torches or doorways strung with Hawaiian leis. Your reception areas should be comfortable and welcoming for guests and visitors. Decorate with over-stuffed couches and chairs in your theme colors -- think bold floral hibiscus prints or primary color stripes -- and create eye-catching displays of products like tanning accelerators, moisturizers and tanning goggles. Use overhead track lighting to complement a bright, cheerful décor scheme or sconce up-lighting for a more intimate feel. In tanning rooms, use tropical-designed ceiling paddle fans, bamboo-framed mirrors and lots of silk greenery. Cleanliness is vital to the reputation of your tanning salon and good housekeeping can keep your décor in tip-top condition as well. Add to your ambience by cleaning and disinfecting surfaces with commercial-grade products and then using air fresheners in tropical or clean, fresh scents, like linen, cotton, coconut or pineapple. Pile fluffy towels in decorative wicker baskets and adorn rooms with rope lights or twinkle lights to provide an ambient glow while in the bed or spray stall. Customers visit tanning salons for a little extra color, and to feel pampered. 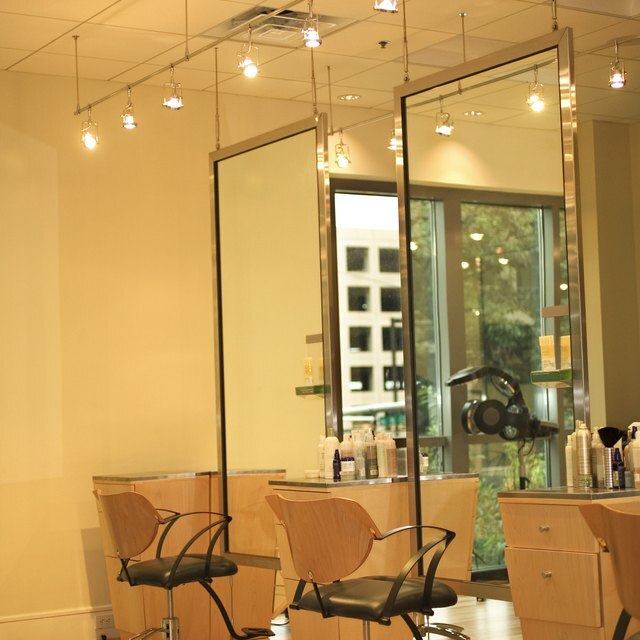 Play music throughout the salon or provide guests with in-bed stereo options for selecting their own tunes. Use decorative hat racks or hooks for hanging clothing and small wicker dressing tables for touching up make-up and hair post-tanning. Use over-sized seashells to hold complimentary mints, towelettes or body sprays so guests can leave feeling refreshed and well-cared for.